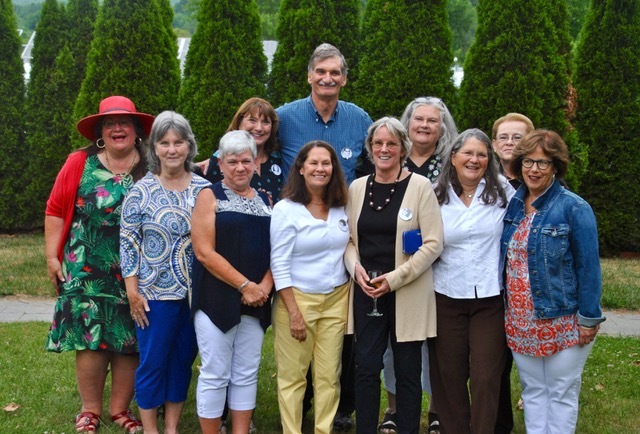 Nearly half of the members of the Monument Mountain Regional high School Class of 1968 were in attendance for their 50th reunion this past weekend. Great Barrington — The village school once loomed large in the daily lives of Berkshire County school children; if one looks closely, remnants of that era remain. The adaptive re-use of both the former Stockbridge Plain School and the former West Stockbridge Village School have provided much-needed municipal office space, while the old Housatonic School remains vacant save for a playground that is enjoyed by neighborhood kids. But did you know that Stockbridge and Great Barrington used to have separate high schools as well? Prior to April 1968, that was, in fact, the case. This past weekend, in an auspicious aligning of dates and with 57 of the 120 class members in attendance, Monument Mountain Regional High School’s first graduating class reconvened to celebrate their graduation from high school, an event that occurred June 23, 1968, in the MMRHS gymnasium. Despite the schools’ regionalization at the start of the 1967-68 academic year, Monument Mountain Regional High School was not ready to be occupied. 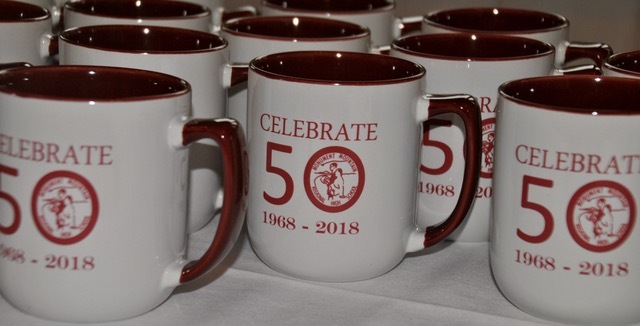 As a result, juniors and seniors were assigned to one of the two high schools — Searles in Great Barrington or Williams in Stockbridge — depending on which courses they had signed up for. For Patti (Montgomery) Hoskeer, who lived on Grove Street in Great Barrington and was accustomed to walking to Searles, the simple choice to enroll in a physics course senior year meant she was bussed to Williams High School (the old Stockbridge Plain School). “We met phenomenal people up in Stockbridge who became our good friends,” recalls Hoskeer of the change senior year. The presence of two high schools had, prior to 1968, meant a lack of cohesion among class members. After the regionalization, everything changed. “When you put a whole class together — and combine [athletic] teams,” lots of fun ensues. Anecdotes abound as to the teenage antics that unfolded that year. Hoskeer recalls often opting out of taking the bus in favor of classmate Mike Parson’s “gangster car,” one in which the doors to the backseat opened in the middle. Commuting to Stockbridge in the morning meant stopping for coffee before classes at the cafe on Main Street, something unheard of in Great Barrington at the time. After school they enjoyed joyriding on the flats — the open stretch of Route 102 by the Berkshire Botanical Gardens — in an attempt to get the car up to 60 mph. Free time might be spent stopping at Sam’s Garage in Stockbridge just south of what is now Berkshire Theatre Group, then owned by the now late Sam Dellea who was also a classmate. And on the weekends? “We had incredible field parties,” recalls Hoskeer, citing McNutt’s field in West Stockbridge as a popular destination. Despite the prevalence of fun, change was not necessarily easy. When the high school and surrounding grounds were ready in April 1968, the senior class found themselves under the same roof for the first time in their school career. For some who had always looked forward to tradition, change was hard — and not terribly smooth. Jane Finn, former physical education teacher at MMRHS, remembers graduation morning being a mess. Several teachers met in the office to sign diplomas — using then-superintendent George Lane’s name — to ensure the ceremony could go off without a hitch. On the morning of June 23, graduates convened in the grassy courtyard just outside the high school’s main entrance on a summer day that was “so hot people fainted,” recalls Hoskeer. Many class members were dismayed by this locale as seniors at Searles had always graduated in the gym, while, for Williams students, graduation took place at Tanglewood. Hoskeer imagines graduation was returned to Tanglewood sometime after 1970 as evidenced by a ticket from her younger sister’s graduation. It was not all smooth sailing for the Class of 1968. As the Vietnam War raged on overseas, talk of the impending draft lottery — the first of which took place Dec. 1, 1969 — caused many young men to enlist rather than wait for their numbers to get called up. The class also suffered the first death of a classmate, Susie Ring, who was killed in a car accident in West Stockbridge in October following graduation. That said, the role of school loomed large in these students’ lives. One of Patti Hoskeer’s new classmates at Williams ended up being her future husband, Brian Hoskeer — a classmate in Jack Spencer’s history class. Spencer would go on to teach the Hoskeers’ two children, April and B.J. Furthermore, three members of the Class of 1968 went on to have successful careers in the Berkshire Hills Regional School District. Hoskeer taught English at the high school for more than 35 years and retired in 2009, Jack Passetto taught fifth and sixth grades in the district until his retirement, and Joanna (O’Brien) Flynn taught at both Bryant Elementary School and the Housatonic School before becoming principal of Bryant. “It’s a shocker when you get to that 50th anniversary — I used to think people looked so old in newspaper pictures,” says Hoskeer. “Now I’m there!” Despite the prevalence of those who have remained local, Saturday’s reunion drew members of the Class of 1968 from across the country and around the globe; Ginny Killfoile traveled the furthest, from Puerto Rico; while Mert Callahan, Nancy Stark and David Jones made the trek from California. In a world of constant and rapid change, it must be a wonderful feeling to return after 50 years to find your school hasn’t been altered or properly maintained. Hey Jerry, that’s either a cheap shot or you are less well informed than you could be. Monument has been really well maintained, I mean meticulously. The custodian staff have always done an incredible job. It is the cleanest, best-maintai ed high school in the region. Capital investment is what has been missing and ongoing efforts are being made there to bri g the building back and upgrade it. Didn’t know Jack had a harem ! I don’t think the “principal” was “George Lang.” The superintendent of the new Berkshire Hills Regional School District was George Lane; my mother was his secretary. Wendy — Thanks for the corrections…we have incorporated them in the story. …and while you’re correcting: the Stockbridge garage was owned by Sam Dellea (not DeLeo) and his father – also named Sam Dellea. Although some may not believe it, Puerto Rico is closer to Massachusetts than California is (by more than 1000 miles). I did travel a long distance, but the class alumni from California take the distance record. And Suzy Ring died in November 1968, not October. And it’s Joanne O’Brien Flynn, not Joanna. Joanne O’Brien Flynn was principal of Bryant and Housatonic School and only taught at Housatonic before becoming principal of both schools. I want to thank Hannah for her terrific article. Though there were a few mistakes, which could have been my fault, she did a wonderful job of reminding us of our senior year full of transitions, new friends and new experiences. Just mentioning Jack Spenser and Mc Nutts field has brought many smiles to people who had not seen each other in years. Even more important, she recognized our class, the first graduating class of MMRHS, when we seemed to have been forgotten or overlooked at the previous year’s celebration. A side note – We actually graduated on June 23, 1968 – exactly 50 years to the day of the reunion. Thank you to all the classmates who came to the reunion and made it such a huge success. I agree with Patti that it was very nice for our forgotten class to finally get some recognition, and I, too, thank Hannah for her article.